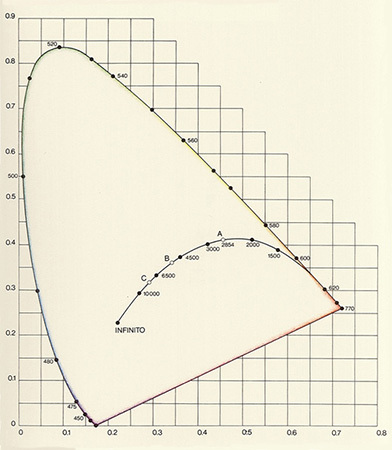 The «Coloroid» colour system which had been under development at Budapest Technical University under the guidance of Antal Nemcsics from 1962 onwards was eventually introduced in 1974. The objective of this arrangement was to provide both a technical and artistic aid to architects involved in coloured environmental design. According to its Hungarian inventor, no contemporary colour systems fulfilled the requirements stipulated for colour planning. As a result, a new colour-space was developed to employ «psychometric scales based on the selections of some 70,000 test persons» as Antal Nemcsics had reported in 1978. A multitude of people, therefore, helped clear the way for the Coloroid system, which is based on «aesthetically uniform» series of colours. Uniform aesthetic spacing was chosen as the guiding principle behind this construction: in other words, a phenomenal equilibrium should be achieved for all colour-scales within the system, with perceived differences ranking in second place. Colour-hue (abbreviated to A), saturation (T) and brightness (V) emerge as the variables in the Coloroid system. In line with colour-systems based on the principle of perception, the entire three-dimensional range of colours is arranged on the inside of a straight-sided cylinder. Colour-hue changes around the circumference of the cylinder, saturation along its radius and brightness parallel to its axis. The neutral colours thus range along this axis between white (W. above) and black (B. below). The horizontal planes at right angles to the axis contain colours of equal brightness, with saturation increasing from the centre outwards. Colours of equal saturation each form the wall of the cylinder, and colours of equal hue are located on the half planes of the vertical sections along the axis. The colours of the spectrum and the purple line are distributed around the axis as shown on the diagram. To be more exact, they are located around an approximately elliptical, inclined section through the three-dimensional construction. They represent the so-called Coloroid limit-colours. The system’s basic colours are selected from these (a total of 48 colours). 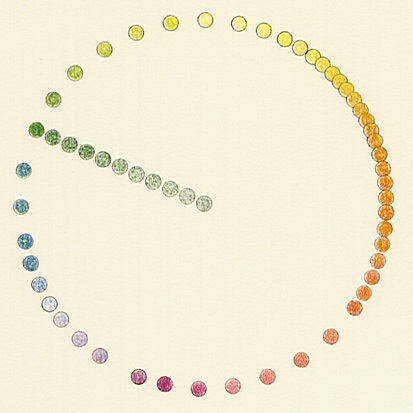 These colours are identified by whole numbers and lie «at distances perceived as being almost aesthetically uniform». The aesthetic uniformity of the scale for colour-hue was, in principle, achieved by asking test subjects to create a colour-circle from 160 colour samples — differing colour-hues at Munsell brightness and chroma V/C=6/12 — in such a way that the continuous scale appeared to change uniformly when viewed as a whole. Each limit-colour in the Coloroid system is linked to white and black by a so-called limit-curve. A closed colour-space is thus created which contains all sensations of colour within an arrangement corresponding to the perceived characteristic values of the system. A (smaller) Coloroid colour-solid containing colours of lesser brightness and saturation is located within this Coloroid-space. The extremes of red (beyond 700 nm) and violet (beyond 450 nm) are not included in its colour-hues. With the outer solid, brightness increases along the scale from black towards white in 100 uniform gradations which are more accurately defined by the system’s authors as the square root of luminosity. Saturation, also divided into 100 units, is defined by analysis of the test colour as an additive mixture of the spectral colours (or purple). The saturation of a colour is stated as being the percentage content of the spectral colour (or purple) existing within the mixture. In the Coloroid planes below right, the half plane sections are shown with the colour-solid. The surface-colour limit-curves also appear in this diagram. In this plane, colour-hue and the characteristic wavelengths of each colour are the same. It is, in fact, possible to describe and detail the exact relationship which exists between this system and the Standard Valency System (the CIE diagram), but we shall not enter further into this. The Coloroid system introduces the phrase «aesthetically uniform colour-space» for the first time. A scale is regarded as being aesthetically uniform when it appears to an observer as both complete and exhibiting gradual change. The idea behind this construction will become clear with the realisation that, when planning a coloured environment, a harmony must be created for colours which, with regard to hue, saturation and brightness, are in fact very different. For the designer, aesthetic uniformity is more important than the ability to accurately register small differences in colour and then repeatedly reproduce them at the same value. He is not so much interested in actual differences between colours as their harmonious interplay. The Coloroid system offers a way of achieving this. Date: The colour-order system had been in development since 1962 and was published in 1974. Basic colours: 48 basic colours lying «at distances perceived as being almost aesthetically uniform». Bibliography: A. Nemcsics, «The Coloroid Color Order System», Color Research and Application 5, pp. 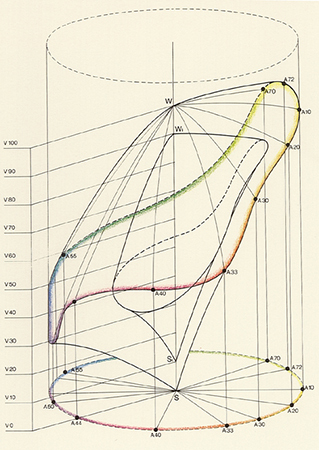 113-120 (1980); A. Nemcsics, «The Color Space of the Coloroid Color Order System», Color Research and Application 12, pp. 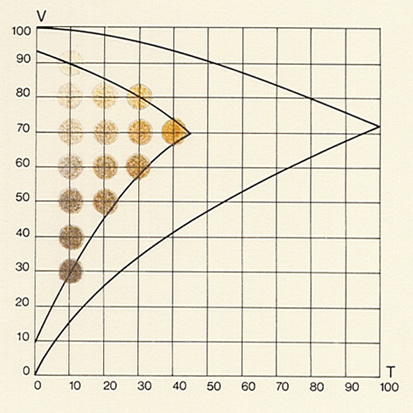 135-146 (1987); F. W. Billmeyer Jr., «Survey of Color Order Systems», Color Research and Application 12, pp. 173-186 (1987).